MZA has revised its business card by updating its look to include the new MZA logo adopted at the time of MZA's 20th anniversary. The new card also includes a unique feature on the back, shown in the image below. The card back features items which will be useful to our clients and colleagues in their technical work. The concentric circles on the left side of the card form a 1-inch and 2-inch laser reticle which is helpful when working on an optical bench to witness the size and shape of a laser beam through an optical train. “We saw many of our customers using the back of business cards in this way, so we've made it handier" commented Dr. Matt Whiteley, MZA's Vice President in Dayton Ohio. 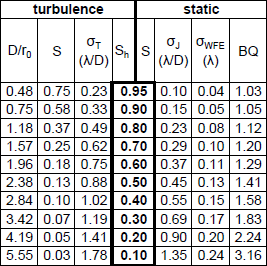 The table on the right is a quick reference tool to help customers draw equivalence between turbulence conditions and commonly quoted optical quantities. Providing these features on the back of our business cards gives employees and colleagues alike useful tools and demonstrates that MZA is a technical and service organization which is helpful from the very first contact. 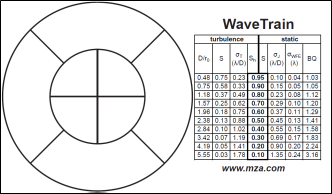 A technical note on the quick-reference table is available on the MZA Website [click here].